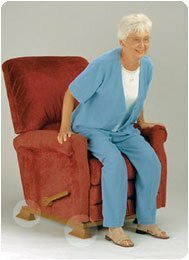 The lifts do not interfere with rocking or reclining, and the lift helps decrease stress on the back, knees, hips, and joints. Compared to other lifts, the four lifts limit the forward tilt allowing an additiona 3"-4" of lift. The StandEasy raises a chair 1-3/4".